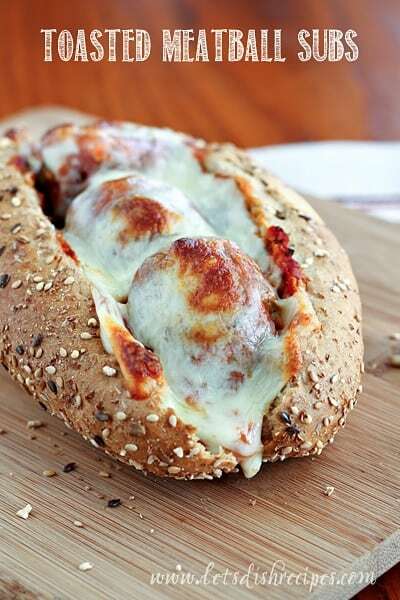 These Toasted Meatball Subs require a bit of extra time in the kitchen, but the results are so worth the effort. The meatballs are absolutely phenomenal, and 100% worth the time it takes to make them from scratch. I like to make the meatballs and sauce ahead of time, then keep everything warm in a slow cooker until I’m ready to assemble the subs. We like our meatball subs spicy, so we use hot Italian sausage, along with the red pepper flakes in the sauce, but using mild sausage and no red pepper flakes offers just as much flavor with a little less heat. If you like your cheese nice and brown, turn on the broiler for the last few minutes the subs are in the oven. These are a huge family favorite and Super Bowl Sunday will be the perfect excuse to make them again. To make the meatballs, combine the ground beef, sausage and spices in a large bowl. Finely chop the onion in a food processor and add to the meat and spices (or grate the onion directly into the bowl). Add the breadcrumbs, Parmesan cheese and beaten egg, along with 1 teaspoon of the olive oil. Combine the mixture thoroughly with your hands. Form into meatballs, about the size of a walnut, adding more olive oil as needed to hold meatballs together. Place the meatballs on a baking sheet and bake for 30-35 minutes. Meanwhile, make the sauce by heating the olive oil in a large pot over medium heat. Add the chopped onion and cook until onion is soft, about 5 minutes. Add the garlic and cook for another minute. Stir in the crushed tomatoes, Italian seasoning, red pepper flakes, salt and pepper and mix well. Add water a little bit at a time until sauce reaches desire consistency. Add the cooked meatballs to the sauce and simmer gently for 30 minutes. To make the subs, preheat the oven to 400 degrees. Place open hoagie rolls on a large baking sheet. Spoon 3-4 meatballs into each roll, along with sauce. Top with sliced cheese. Bake for 12-15 minutes until the rolls are toasty and the cheese is browned and bubbly. I never thought to bake my meatballs. I always fry them. This way is much healthier. Thanks. They look delicious! Lovely. I was looking for something to make on this Friday night, and this fits the bill. Thanks for the inspiration! I never ever ever like meatballs…but the picture made me want to try it out. They are delicious!!!! 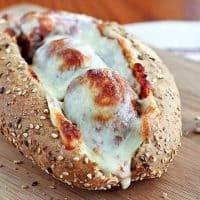 My son loves meatball subs and says this was the best ever! A keeper in our house! Thanks for sharing. Thanks so much! As the mother of 3 boys, I know that “best ever” is quite a compliment! 🙂 So glad you enjoyed them.